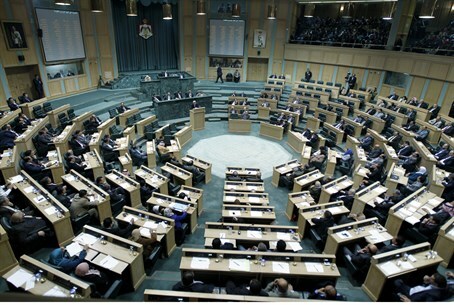 Lower house of Jordan's parliament demands release of Ahmed Daqamseh, who murdered seven Israeli schoolgirls in 1997. The lower house of Jordan's parliament, incensed over the shooting death of a Jordanian judge by Israeli soldiers, on Wednesday demanded that the government free a terrorist who murdered Israeli schoolgirls in 1997, AFP reported. In a non-binding resolution, all 150 members of the lower house said "we demand that the government release Jordanian soldier Ahmad Daqamseh from jail." Daqamseh was a soldier in the Jordanian army when he opened fire on a group of students who were visiting the “peace island” of Naharayim on March 13, 1997, as part of a class trip. Naharayim is located right near the Jordanian border, and Daqamseh opened fire on the girls from the Jordanian side. He killed seven of the students, and wounded six others before being caught by Jordanian soldiers. Daqamseh was sentenced by a Jordanian military court to life in prison. "We also demand that the government expel the Israeli ambassador in Amman and recall the Jordanian ambassador in Israel in response to the killing of Jordanian judge Raed Zeiter," the resolution said, according to AFP. The resolution gave the government until Tuesday to meet its demands, failing which it threatened a no-confidence vote against Prime Minister Abdullah Nsur. Monday’s shooting at the Allenby border crossing had sparked the fury of both Jordan and the Palestinian Authority (PA), with protesters in Amman demanding the expulsion of the Israeli ambassador and the abrogation of the two countries' 1994 peace treaty. The PA, for its part, demanded an international investigation into the shooting. The IDF explained that Zeiter was shot in the process of attacking a soldier and attempting to seize his weapon. The lower house said that "what happened proved that Israel is a racist country that does not want peace." Prime Minister Binyamin Netanyahu on Tuesday expressed "regret" over the fatal shooting of the judge. "Israel regrets the death of Judge Raed Zeiter yesterday (Monday) at the King Hussein (Allenby) bridge and expresses its sympathies to the people and government of Jordan," the statement from Netanyahu's office said. Jordan's Prime Minister Abdullah Nsur said on Tuesday that the Israeli government was "completely responsible" for what he described as the "hideous" shooting of the judge, adding, "The Israeli government’s excuses do not justify that treacherous act." Wednesday’s resolution is not the first time that Jordan’s parliament has called for Daqamseh’s release. Last year, 110 out of 150 Jordanian MPs signed a petition calling for the release of Daqamseh. In 2011, the Jordanian Justice Minister, Hussein Mjali, caused an uproar when he called for Daqamseh’s release, claiming that he is “a hero. He does not deserve prison. If a Jewish person killed Arabs, his country would have built a statue for him instead of imprisonment." Daqamseh has denied committing any crime and has said that he should be freed from prison since he had simply fulfilled his national and religious duty by killing the students.